Randy is a 1987 graduate of St. Patrick High School. He received his bachelor of arts degree in secondary education and also his master of arts degree in secondary school principalship from Central Michigan University. He taught at Central Montcalm Middle School from 1993-2008. 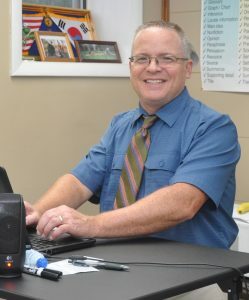 Randy became principal of St. Patrick School in 2008. Randy and his wife, Michelle are parents to two children, Savannah and Sam, who are both graduates of St. Patrick School. A written request, including the topic, must be submitted no later than eight days prior to the meeting. The request may be submitted to either the school administrator or the chair of the School Board to be placed on the agenda. For your convenience, you can fill out this online form to submit your request. Every attempt will be made to notify you no later than the Thursday before the meeting if your request can be honored. You will be given ten minutes to address your topic followed by five minutes of discussion/questions if needed to clarify any points. Any parent of a St. Patrick School student, as well as any contributing member of St. Patrick Parish, is welcome to address the School Board using the follow procedure which was established in October 2007. The School Board will post the agenda items prior to a scheduled meeting. Some additions or deletions may occur before the meeting takes place. The School Board minutes will be posted following the scheduled meeting date. I am a graduate of Portland St. Patrick (Kindergarten through 12th grade). In 2012, I earned a bachelor’s degree from Central Michigan University with a major in Broadcast and Cinematic Arts and a double minor in Media Design, Production, and Technology; and Leadership. I currently work as the director of communications for the Diocese of Grand Rapids, prior to that role I worked as the marketing communications coordinator for Catholic schools in the Diocese of Grand Rapids. My husband, Brian, and I reside in Kentwood. I was born and raised in Portland and I am very proud to say that I am a graduate of St. Pat’s. My husband Brian and I have three sons who attend, or have graduated from St. Patrick School. I have a BSBA degree from Central Michigan University. I worked full-time at Lansing Community College for 25 years. I retired from LCC in June 2011. The twelve years I spent attending St. Patrick School were happy and rewarding. St. Patrick School instilled in me a strong academic work ethic, rooted in a Catholic foundation. Brian and I are happy to see our sons growing and learning in the same environment surrounded by teachers and staff who truly care. Please feel free to call me anytime at 517-526-1058 or email me at Nancyw@municipalsupply.com. I have lived in Portland my entire life. I am a proud graduate of St. Patrick School. My husband, Mark and I have three children who all graduated from St. Patrick School as well. I am so thankful we sent our children to St. Pat’s to receive a great education and a solid Catholic foundation. I graduated with a BS/BA from CMU. About 15 years later, I returned to CMU to earn my master’s degree in school counseling. I have been employed at Pewamo-Westphalia Schools for the past 15 years and am currently the MS/HS Counselor. Don’t hesitate to contact me with questions or concerns. I can be reached at 517-256-2436 or bartlett_lisa05@yahoo.com. I grew up in Westphalia and attended St. Mary’s Elementary School and graduated from Pewamo-Westphalia High School. I went on to attend Lansing Community College and graduated as a Registered Dental Hygienist. I am currently employed by Dr. Jami Schneider here in Portland. My husband Nick is a lifelong member of St. Patrick Parish and attended St. Pats. We have three children that are enrolled at St. Patrick. Our children are active in sports and extracurricular activities with the school and Church. I feel blessed that my children are able to attend a school that allows them to grow as students as well as grow stronger in their faith. My husband, Jay, and I moved to Portland in 1999. We have three children that attend St. Patrick School. I graduated from Grand Valley State University with a bachelor’s degree in Business Administration majoring in Accounting. I am a certified public accountant and have over 17 years of experience evaluating internal controls and performing and overseeing financial and performance audits. I am currently the Director of Accounting and Financial Reporting within the State Budget Office. I am blessed that my children have the opportunity to attend St. Patrick School and look forward to serving on the School Board. Feel free to contact me at 517-526-2122 or jrhaboyd@yahoo.com. My husband, Todd, and I moved to Portland in 2000. We have three children who attend St. Patrick School. We are grateful to have a Christian school for our kids to attend. We enjoy supporting the school and the parish as much as possible. I have a Bachelor of Science degree from WMU and a Master of Education degree from GVSU. I work atPortland High School teaching math and science. I enjoy teaching and hope that I can be a useful resource for the school commission. Thank you and I look forward to hearing from you! Contact me at 647-6858 or jdavlin@portlandk12.org. I am a graduate of Portland St. Patrick School (4th Generation). My wife, Dawn, is the head coach for the boys and girls track and field teams. All four of our children currently attend St. Pat’s. After graduating from St. Pat’s, I earned a Bachelor of Science in Engineering from Western Michigan University in Construction Engineering & Management with a dual minor in Management and Mathematics. I have over 15 years of experience in the commercial construction industry as a construction manager and currently work for the State of Michigan in the multi-family housing market. As we work to build upon a solid Catholic foundation and nurture a positive environment where the students, school, and community flourish, I look forward to hearing your comments and ideas. You can reach me at 517-526-5018 or x97fedewa1@hotmail.com. I am a lifelong member of St. Patrick’s Parish. I graduated from St. Patrick high school in 1986 and went on to receive my associate’s degree in Dental Hygiene from L.C.C. In 1991, I received my bachelor’s degree in Human Resource Management from Spring Arbor University. I work in the dental office of Dr. Jami Schneider. My husband, Keith is also a graduate of St. Pat’s,and our three children are currently enrolled here, as well. All of us are very active in church, school and sports activities and you can find us most nights right here in the bleachers. I am honored to be asked to serve and I am excited to play a part in the Church/School that is such an integral part of our lives. I have lived in Portland my entire life and attended St. Patrick School from Kindergarten through graduation (2007). My husband, Luke, also attended St. Patrick School. We have two young children, who will also attend St. Patrick School in the future. I graduated from Grand Valley State University in 2011 with a Bachelor’s degree in Clinical Exercise Science, then went onto Michigan State University to complete my Master’s degree in Public Health (2014). I am currently employed with the State of Michigan. If you have any questions or concerns, please feel free to contact me at (517) 526-3411 or schraubenm2@michigan.gov. I am a lifelong member of Portland St. Patrick, graduated from St. Pat’s High School and sent all five of my children to the school. Though the kids have been out of school for many years, my heart remains at St. Patrick’s and I have tried to stay active and involved here. I have a bachelor’s degree in Marketing and Management from Northwood University. Please do not hesitate to call me if you have questions or concerns. My phone number is 517-575-8000 and my e-mail is suevanlente@gmail.com. I am a graduate of Portland St. Patrick School. I then went on to Central Michigan University to earn a bachelors degree in dietetics. I am currently a registered dietitian and certified diabetes educator. My husband, Jon is also a graduate of St. Pats. We have three children, one is a St Patrick graduate and two are currently enrolled.